US AUTHORITIES ARRESTED a 15-year-old last month for allegedly plotting an Islamic State-inspired attack that US media said had Pope Francis as its target, it was revealed today. Francis is scheduled to visit the United States between 22 and 27 September for the first time, in a tour culminating with an outdoor mass in Philadelphia after stops in Washington and New York. The US Department of Homeland Security and the FBI disclosed the unidentified 15-year-old’s arrest in a joint intelligence bulletin on 14 August, without mentioning that the pope was the target. The minor obtained explosives instructions and further disseminated these instructions through social media. ABC News cited unnamed sources as saying the “foreign dignitary” referred to in the statement was Pope Francis, and that the boy was arrested near Philadelphia. Isil is an alternate acronym for the Islamic State, the extremist group engaged in atrocity-filled campaigns to establish a “caliphate” in Syria and Iraq. Michael McCaul, chairman of the House Committee on Homeland Security, said on Sunday that US authorities had broken up a threat against the pope, but gave no details. 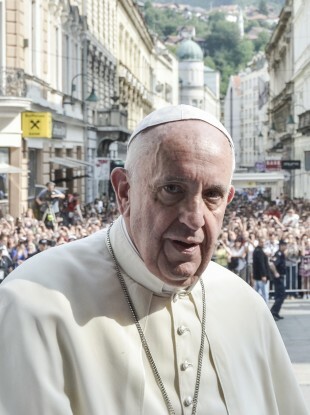 “We’re monitoring very closely threats against the pope as he comes into the United States. We have disrupted one particular case,” McCaul told ABC’s This Week show. But ABC said its sources had said the boy did not pose an imminent threat, his plans were “aspirational” and there were questions about his mental health. Nevertheless, he was charged with attempting to provide material support to a designated foreign terrorist organization, namely IS, the government said. Email “Teenager arrested for 'planning Islamic State-style attack on Pope'”. Feedback on “Teenager arrested for 'planning Islamic State-style attack on Pope'”.